Fishing Lures by Krippled - Recreation - "Jim Gilbert Dodgers"
Jim Gilbert Dodgers were designed in 1968 and named after Jim Gilbert, who developed the entire Krippled line of tackle. 15 cm. - 2.5" x 6"
20 cm. - 2.5" x 8"
23 cm. - 2.5' x 9"
28 cm. - 2.5" x 11"
33 cm. - 2.5" x 13"
Dodgers are made of metal, either polished stainless steel, or plated brass, and designed to sway back and forth, activating your lure with short jerks as the dodger reaches the apex of its sway. For a dodger to be productive it should not only activate your lure or bait but also attract game fish by itself. 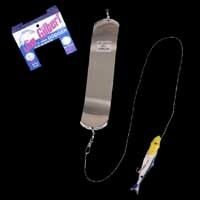 Jim Gilbert Dodgers are recommended for deep trolling or down rigger fishing where maximum light attracting flashes and erratic lure swaying action is most important.